One of London's most famous and popular market areas and spiritual home to the Goth/alternative scene. Page last edited 2006-07-31 17:29:38 (version 6). Photo by pietroizzo. Licensed under Creative Commons By-NC-SA 2.0. 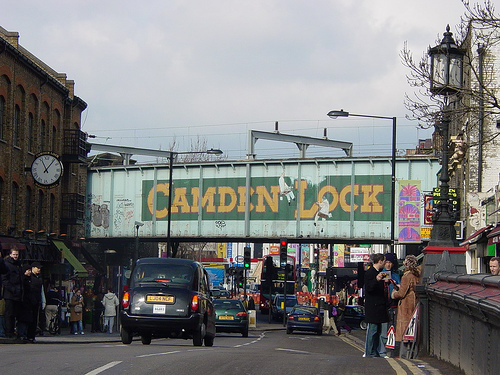 Nearby Tube Stops: Camden Town, [Chalk Farm]? These markets are big on clothes, as are many of the shops on this stretch of Camden High Street. Camden is a good place to go of a weekend if you are into markets, even if just for people watching. Camden market also has your usual bric-a-brac. Canal boat trips between here and Little Venice also stop at London Zoo. Camden Lock Market is home to Village Games. Last edited 2006-07-31 17:29:38 (version 6; diff). List all versions.